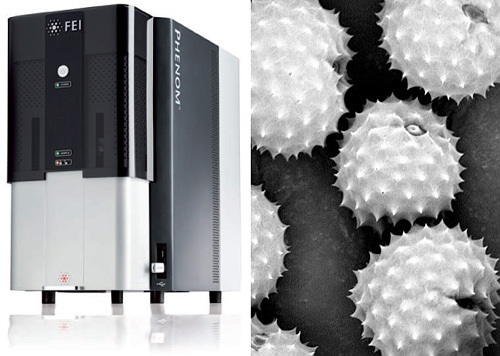 Phenom – The World's Smallest And Most Affordable Scanning Electron Microscope | OhGizmo! By Andrew Liszewski on 07/25/07 • Leave a comment! The Phenom is capable of magnifying a specimen from 20X up to 20,000X with an image resolution of 2048×2048 pixels in about 30 seconds. Images are saved on a USB flash drive allowing them to be moved to other computers for more in-depth analysis. The machine and its controls are apparently very user friendly and only requires a few minutes training to produce cool images like the ragweed pollen sample seen above. This means that a facility investing in the Phenom also doesn’t have to pay a skilled operator in order to actually use the device. Of course the $85,000 (EURO 62,000) price tag isn’t exactly cheap but for smaller research facilities or companies dealing with nanotechnology it’s probably more than worth it.